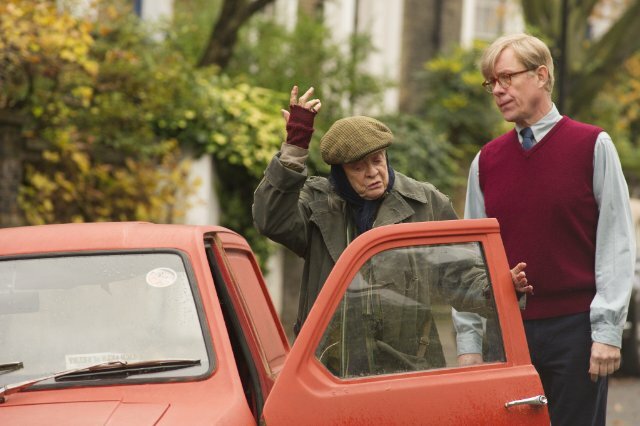 If The Lady in the Van is a strange movie, it is also an intriguing one. Billed in the opening credits by playwright Alan Bennett as “mostly a true story,” the story offered Bennett a rare chance to explore himself by creating two characters (both played beautifully by Alex Jennings). One is the man who lives life, the other is the writer in permanent collusion with his typewriter. Bennett #1, who is out in the real world acting in a play in the West End, is suddenly confronted with the arrival of Miss Shepherd who parks her old wreck of a van in the driveway of his lovely row house on a an equally appealing curving lane in a neighborhood of fellow intellectuals. Miss Shepherd is unfailingly curt and completely lacking in the niceties of conventional conversation. Bennett includes all the discomforting details of her daily life but stops short of calling the police to have her removed. The strange standoff between Miss Shepherd and Mr. Bennett lasts for fifteen years and ends in a kind of stalemated acceptance – by both the men who are Mr. Bennett as well as by the neighborhood. What makes the story work is Alan Bennett’s own confusion about himself, so comically evident in Alex Jenning’s dual portrayal. Bennett once said in his own much rewarded real life as playwright, “One obstacle always stopped me directing films – namely, having to say, ‘Action!’ My instinct would be to say, ‘Er, I think if everybody’s agreeable we might as well sort of start now – that is if you’re ready’. Mix that reticence with a small bit of compassion and there stands the Mr. Bennett who tolerates – to his own confusion – the confounding Miss Shepherd. Surely only Maggie Smith could have created a woman clinging to her dignity in an uninterrupted flow of mighty arrogance while living in the squalor Mr. Bennett shows us so clearly. And all the while, the sharp intelligence peeking out from the cracks tells there is more to this story than what we are seeing. We wait for that, and when it comes in a moving revelation, we realize how deeply we have been touched by the lady in the van and her reluctant protector. The downside is that we wish we had seen it sooner and for longer. Maggie Smith is so sharp that she shows us exactly who Miss Shepherd is in a quarter of the time spent dealing with it on-screen. We didn’t need more than an hour to watch Director Nicholas Hytner trying to draw humor from the filth of self and surroundings. Smith, of course, hits a home run in the final scenes, but frankly, by then we are exhausted. The combination of the other worldly talents of Maggie Smith and Alex Jennings as they bring Alan Bennett’s “mostly true story” to bristling life couldn’t possibly work in lesser hands. But these people are masters. This review was posted on March 4, 2016, in Uncategorized. Bookmark the permalink.